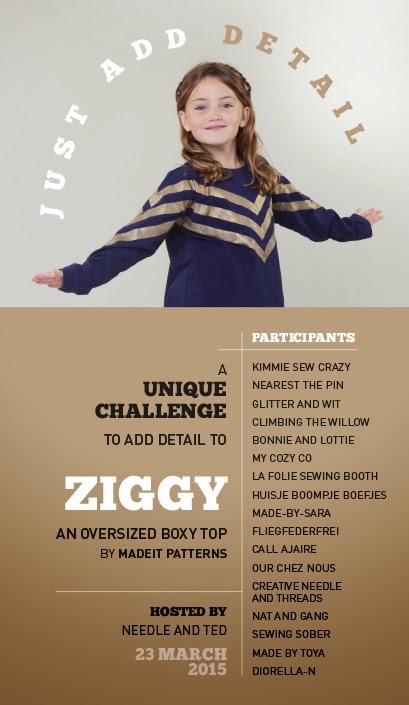 After my first Ziggy Top earlier this year, I fell in love with the pattern so I couldn’t say no when I was asked to participate in the Just Add Detail competition run by Madeit Patterns. The idea is to take this great oversized top and add a unique detail to change it up. The winner will be the maker with the most interesting detail. You can read more about the details (see what I did there?) of the competition here. For this Ziggy, I decided to take a basic fabric and manipulate the fabric itself. 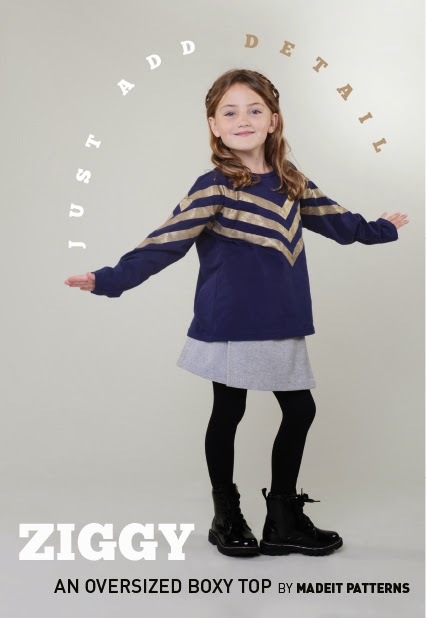 I bought this lightweight sweater knit in the cast off bin of G Street Fabrics in the early autumn with plans to make soft tights for Bean. It’s a subtle lavender color so I knew she’d love it since purple is everything to her these days. However, each time I picked up the fabric to cut out a pair of tights I reconsidered since it’s so supple and just begged to become an actual sweater. As it’s approaching spring weather here I thought this was the perfect opportunity to finally make it into the sweater it wanted to be. I started out with a large piece of the fabric which I knew would later fit the front pattern piece even with some width and height removed. I made a diagonal pintuck which I imagined would look like it was coming from the right shoulder. 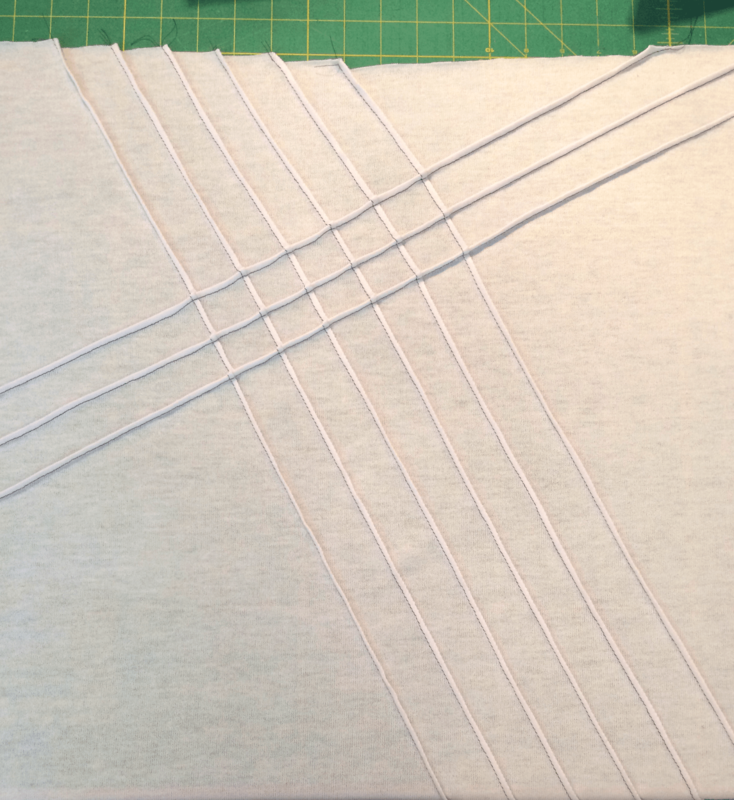 I continued to make pintucks along the same diagonal, until I had six in total. 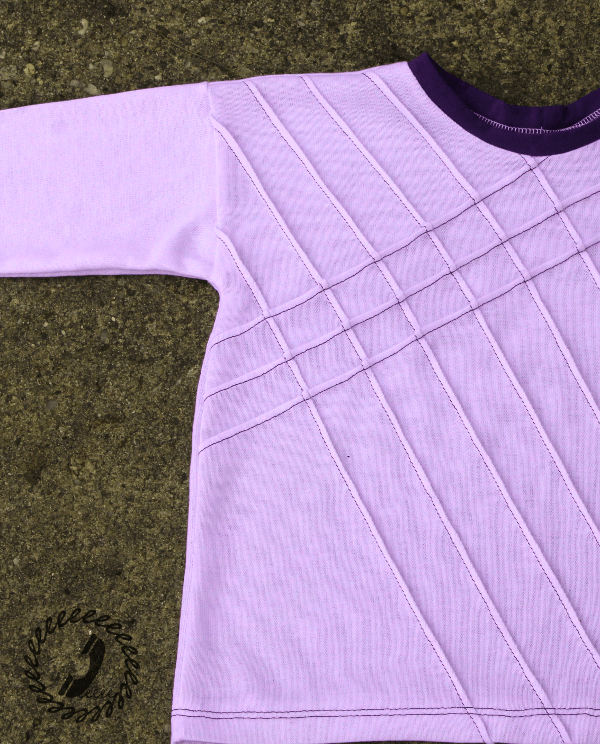 As this is a lightweight knit, I did a lot of pressing and a used a bit of starch to make sure the fabric didn’t slip around too much. I also used the walking foot on my sewing machine to avoid any stretching or pulling. Once I pressed the six pintucks in the same direction, I made a pintuck in the cross direction, but slightly off center. I wasn’t going for a big X in the center of the top, though that would be cool too. To avoid the X I made only three cross pintucks and kept them toward the top. All of this was improvised, but as soon as I was done with the third cross pintuck I knew it was done. I probably should have used a ruler and marked where the lines should go, but in all honesty this was an idea that popped into my head in the eleventh hour so I dropped my original look and jumped onto this one. Knowing that I wouldn’t have time to wash out any markings, I just eyeballed everything as I went along. 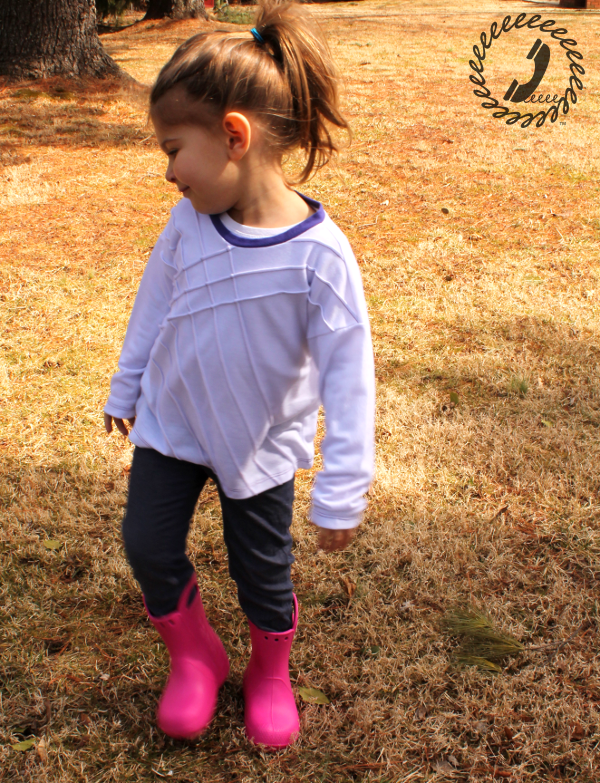 Speaking of eleventh hour, the Ziggy Top is so quick and easy to assemble it is the perfect last minute make. It took more time to do the pintucks than it did to complete the entire rest of the top – including the hems. It’s the perfect go to layering piece. Bean was under the weather yesterday so it was tough getting any decent pics of the sweater. 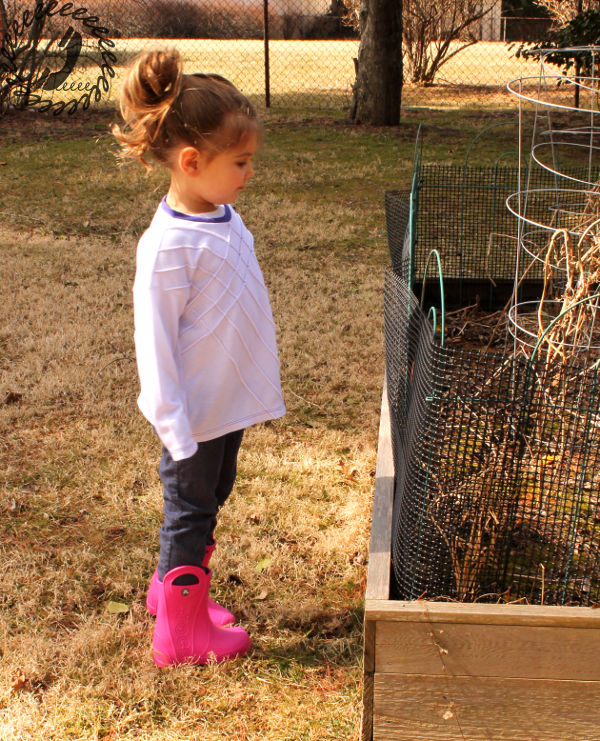 I almost skipped it completely since she was looking so poorly in the morning, but around noon she perked up and begged to go running around outside. I used the opportunity to let her get some fresh air in her lungs and also snag a few pics before she wore out. 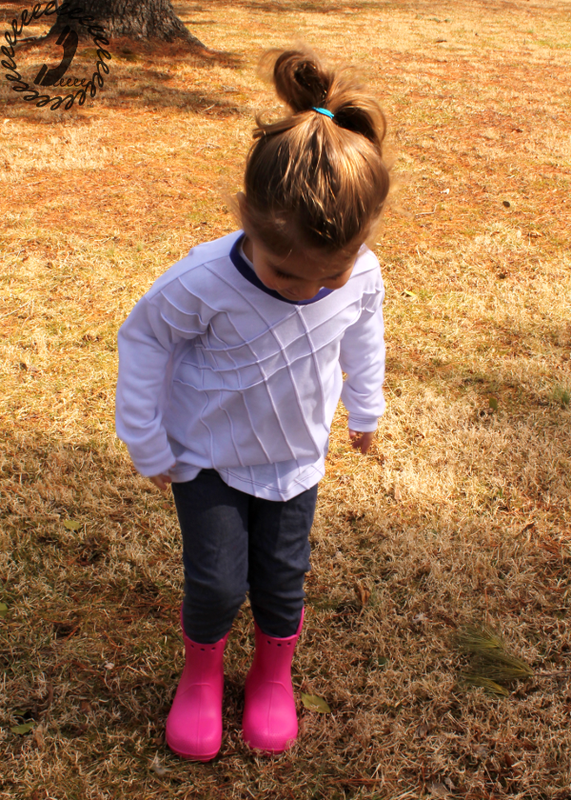 She loves her new purple sweater and I love the texture and interest those little pintucks lend. Once I had finished manipulating the fabric, I simply cut out the front pattern piece and sewed the rest of the sweater together according to the instructions. Super easy! I can’t wait to see what everyone else’s details are because I know it’ll bring so much inspiration to such a lovely base pattern concept. Below is the list of other bloggers who are in the competition. All of the looks will be posted today, so take a moment of your Monday to check out some cool inspiration! 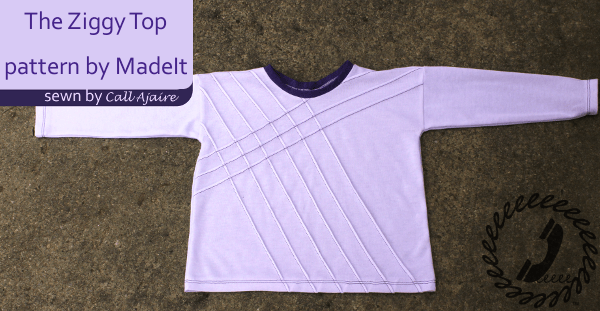 And until March 29th, the Ziggy Top will be 20% off in the MadeIt Pattern Shop, so there’s plenty of time to purchase your own and put some of these ideas to use! I'm really impressed with how great your pintucks look on a sweater knit! And I love the contrasting thread! This is such a great idea! Really cute and it looks really perfect, my "eyeballed" things never look this good, great job. Such a great idea and so very neat and straight what an amazing job, I really love how simple the design is but it has so much impact, really great! I agree with the other comments – what a clever way to add interest to the pattern. Great job!!! Very, very clever. And so neat and even without measuring. I'm super impressed. Love love love the pinstripes! So much elegance! Did I miss the part where you said that you added a darker purple neckband? I think that's pretty cool but I don't see any mention of it. The pintucks are cool too, but this is another way to personalize it.